The best parts are with my staff, sharing the sacred space with our guests, and connecting with the local community. My wife and I have always valued hospitality and local community as the best expressions of our faith. After moving into administrative positions, I came to see the importance of creating a culture in which people could dip into (at whatever level they choose) and enjoy the current of the culture. I see cultivating that culture as my number one responsibility. My writing is a reflection of my life, in all aspects. The pictures and feelings I express come from the daily air I breathe, the sights and sounds I take in, and how I see and process the world around me. I don’t know any other way. I’ve recently been reading “Devotions: The Selected Poems of Mary Oliver”, sort of as an homage to her since she died. 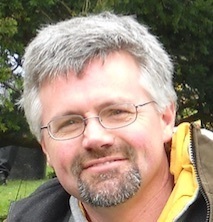 Dan Oberg serves as Executive Director at St. Andrew’s House, a retreat & conference center owned by the Episcopal Church of Western Washington.Dan was previously Director of the Grünewald Guild, an art & faith community near Leavenworth, for 10 years. Prior to that experience, Dan served as a lay minister in a number of nonprofits over the past three decades, as an administrator, counselor, program coordinator, Board member and consultant. With his MA in Marriage & Family Ministries from Fuller, Dan is a Clinical Member of the American Association for Marriage & Family Therapy, and also received a Certificate in Leadership in the New Parish with The Seattle School of Theology & Psychology. Dan is married to his lovely wife, Lois, and has two grown sons, embarking on adventures of their own.